Obol Never eat soggy cereal again! That is one of things I despise….soggy cereal! I hate it. So much so, that I would rather throw the cereal out, then eat it. And you know how I hate to throw things out. I received a big and a small Obol in exchange for an honest review. All opinions expressed are 100% my own and may differ from yours. Whenever I get ready to pour my milk into my cereal, I make sure that I am not going to get interrupted, for fear of soggy cereal. But, sometimes it just can’t be helped. The phone rings or the doorbell rings or I get interrupted by something or someone. Then the bowl of cereal would end up in the garbage. 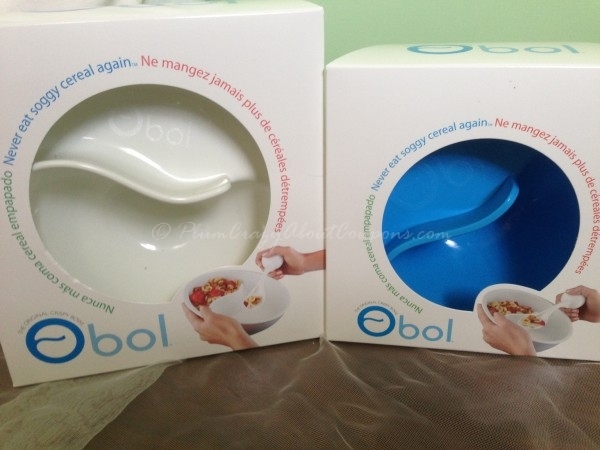 Thanks to Obol, there is no more soggy cereal. You separate the cereal and the milk in the bowl. You drop the cereal into the bowl as you want to eat it. Problem solved! The Obol is The Original Crispy Bowl! It has a unique Swoop n Scoop Spiral Slide Design, that makes every bite as crispy as the first. I have always been known to hold my cereal bowl right up to me when eating it. And sometimes, I have also been known to drop the bowl. It just jumps out my hand. With the Obol, it has a textured non slip grip and rim, so you can use it practically anywhere, without dropping it. So, if you want to eat in bed, go ahead (if you allow it), or watching a movie……wherever, whenever! I also like it for soup and crackers. I like to use those little oyster crackers, but hate it when they fall apart in the hot soup. Now, I can just slide them into my soup as I am eating it, and no more soggy crackers! The Obol is also on the top of my list, because it is made in the USA. I am a big believer in buying products in our country. It comes in 2 sizes, Large 8 inch and Medium 7 inch. They are food safe and made of BPA free polypropylene. You can put them in the dishwasher (thank goodness) too. The medium size holds 1 cup in each section and the large holds 1 1/2 cups on top and 2 cups in the bottom section. You can purchase the Obol on Amazon. You can connect with Obol on Facebook and Twitter.